Based only on what we see when we watch stars in the sky, it’s easy to believe that the stars revolve around a stationary Earth, a common misconception among children. Although many students have at least heard that the Earth spins, they may not have thought about how this affects how we see stars, planets and the Moon. 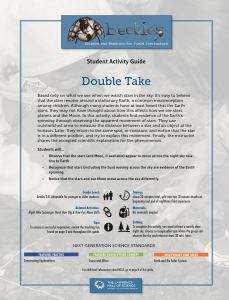 In this activity, students find evidence of the Earth’s spinning through observing the apparent movement of stars. They use outstretched arms to measure the distance between a star and an object at the horizon. Later, they return to the same spot, re-measure, and notice that the star is in a different position, and try to explain this movement. Finally, the instructor shares the accepted scientific explanation for the phenomenon. Notice that the stars and our Moon move across the sky differently.